Most citizens from western countries entering Thailand without a visa are granted a 30-day stay upon arrival with proof of an onward ticket. You can extend your stay a maximum of 10 more days. You can apply for a tourist visa beforehand, which usually costs around $50 and allows you to stay 60 days. 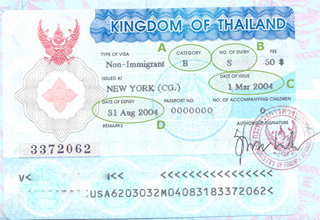 Tourist visas can be extended for 30 days for an additional 1900 baht. However, you cannot work with a tourist visa. Non-immigrant visas cost around $100 and allow you to stay up to 90 days. You must provide a letter of intent from your school or placement organization stating you are going to work for them as a teacher in thailand. You can also obtain this visa if you intend to take classes or study meditation through a Buddhist retreat. There are no extensions available for a non-immigrant visa. The best thing to do is apply for a non-immigrant visa beforehand, and ask your school for help with obtaining the required work permit. Getting a work permit is a long and sometimes frustrating process, but commercial and government schools will help you. It is important to dress neatly when you go to the Immigration Department. It took about 3 months before I was granted a one year work permit to teach in thailand, and I had to go to Immigration a few times. If you cannot get a work permit, you will have to leave the country every 3 months. Airfare depends on when you travel - June to August, Christmas, and New Year are peak times. Most major airlines fly to Bangkok from the US, and cost about $1000 round-trip. Cathay Pacific, Malaysia Air, and Thai Airways fly out of LA. Korean Air is a little cheaper than most airlines - $700 to $850 round-trip. Cheaper travel options are bucket shops, which buy and re-sell consolidated fares for a lower price. You can also expect low service from these places. Many courier flights from LA and San Francisco cost one-half or two-thirds of the price of normal flights, but there are restrictions on luggage, length of stay, and departure dates. For best prices on air fare be sure to check the Bangkok Post and the Nation, the 2 leading English daily newspapers in Thailand. Both have a section with travel prices.